Euonymus, aucuba, holly, pileostegia viburnoides, omphalodes and heuchera. Merry Christmas to you all ! Hello Hywel ... Thanks .. Happy Christmas Terra and family. I hope they've got their stockings hanging up! Happy Christmas Terra I hope its a great one x. Happy holidays to everybody on the team. You got your pups well trained Terra. They are very handsome. Thank you Terratoonie :o)) hope you too enjoy yours and hope santa brings you all what you wish for. .. and Crocus budgie has comfortable perches too ;o) Lol. You're not losing it ... Lol.. Thanks for coming back to the photo again. Happy Christmas to you, Millie, Poppy and tortoises. Merry Christmas to you all Terra, beautiful photo. Are you nearly ready for Christmas ? Very nice too. Tt ! And to you and yours Tt. 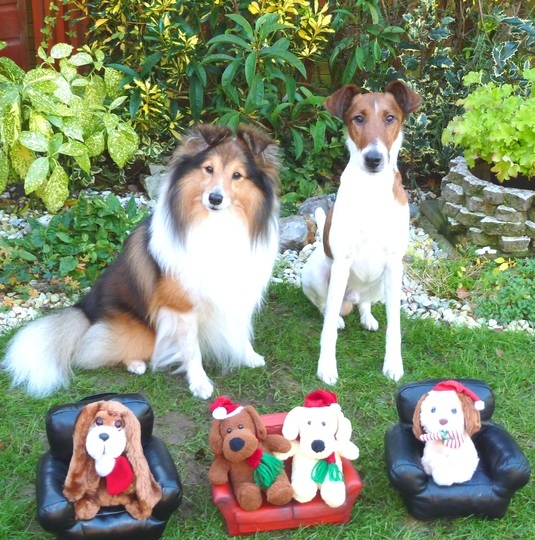 All my dogs' chairs and toys come from the charity shops ! Conker loves being groomed ... but Truffle wonders why I don't spend time grooming him ! I can see those shrubs from my back windows ... nice evergreens for winter... Yes, you are right .. I must make sure I keep them under control ! Hmm...that reminds me...what a change in Molly since she started her new urinary diet. She LOVES it and like Truffle, she is keen on letting me know as soon as it's dinner time. Every day at 5.30 she is at the door to the garage demanding her next meal. I've never known her to behave like this before....but it's just as well she does like it as it's the only one we could find that suits her urinary needs AND her allergy needs! She'll be eating it for the rest of her life and no treats whatsoever. Imagine that! No turkey for her on Christmas day! Merry Christmas to you all,Terra..great photo..love and hugs, xxxx..
Merry xmas to you aswell, pleased all of you are keeping well. Plenty of toy guests for our Christmas sofas.. Lol. Lovely to hear from you ! the UK is having lots of rain ! Happy Christmas to you and yours .. Thank you very much, TT! Your garden looks very nice.